Climate change is widely believed to be occurring because the level of carbon dioxide and other greenhouse gasses in the atmosphere is increasing, so leading to an increased retention of heat from the Sun. As a consequence, the Intergovernmental Panel on Climate Change (IPPC) predicts that average global temperatures will rise by a minimum of 1.1 degrees centigrade by 2100, and maybe by as much as 6.4 degrees . The level of greenhouse gases in the atmosphere was at about 280 parts per million (ppm) before the Industrial Revolution, and had risen to 317 ppm by 1958 when detailed measurements started to be taken. Today, greenhouse gas levels are over 400 ppm and are expected to increase to somewhere between 450ppm and 550ppm depending on the level of action taken to constrain their emission. In 2014, the IPPC produced a highly detailed Synthesis Report to amalgamate a wide body of evidence relating to climate change. A great summary of this report is available here, and notes that "human influence on the climate system is clear [with] recent anthropogenic emissions of greenhouse gases [being] the highest in history". As the report continued, "warming of the climate system is unequivocal, and since the 1950s, many of the observed changes are unprecedented over decades to millennia. The atmosphere and ocean have warmed, the amounts of snow and ice have diminished, and sea level has risen". In October 2018, the IPCC issued a special report on the predicted consequenes of 1.5 degrees of warming, and the extent of mitigation measures required to constrain warming to this level. As the report notes, limiting warming to 1.5 degrees demands "rapid and far-reaching" changes to most aspects of human activity, with green house gas emissions needing to be cut by about 45 per cent from 2010 by 2030, with a net zero of human-caused emissions reached by 2050. You can read a one page press summary of the IPCC October 2018 report here, and a more comprehensive synthesis report here. Most people -- and pretty much all governments -- now accept the above to be fact. Reflecting this, in December 2015 the largest ever meeting of presidents and prime-ministers in history was held in Paris to agree a course of action. The outcome of their talks -- the "Paris Agreement" -- reaffirmed the goal of limiting the increase in global temperatures to well below 2 degrees Celcius, while urging efforts to limit the increase to 1.5 degrees Celcius. To this end, the Paris Agreement articulated two long-term emissions goals: firstly, for emissions to peak as soon as possible; and secondly for "net greenhouse gas neutrality" (ie carbon emissions meet carbon sinks) in the second half of this century. The Paris Agreement was a watershed for humanity, and puts more emphasis on process and progress, rather than defining and meeting specific targets. To this end, every country needs to set and communicate its "nationally determined contributions" (NDCs) that will reduce greenhouse gas emissions and so mitigate climate change. Further, via an inbuilt "accelerator mechanism", every nation is committed to review its NDCs at least every five years, and to implement even more significant emissions reduction targets for the period ahead. There will also be a "global stocktake" of greenhouse gas emission levels in 2023. You can read a good summary of the Paris Agreement published by Climate Focus here. Having signed the Paris Agreement, all individual nations needed to legally ratify it, and for the Agreement to enter into force at least 55 nations responsible for 55 per cent of global greenhouse gas emissions were required to complete such ratification. This occured in early October 2016. As a consequence, the Paris Agreement come into force on 4 November 2016. By September 2018, 195 countries have signed the Paris Agreement, with 179 having ratified, covering 88.73 per cent of global greenhouse gas emissions. To the alarm of many, Donald Trump has indicated an intention to withdraw the United States from the agreement. However, given that the US is responsible for about 18 per cent of global greenhouse gas emissions, even if this occurs the Paris Agreement will remain in force. China (responsible for 20 per cent of global greenhouse gas emissions) has also indicated that, even if the US leaves the deal, it will remain party to it an a strong supporter. China is also investing heavily in alternative energy and other technologies that will assist in reducing emissions and migitating climate change. As noted above, under the Paris Agreement, every country is required to determine and implement its own NDCs. To provide just one example of how this is happening in practice, in April 2018 the Government in the United Kingdom made this submission to the United Nations Framework Convention on Climate Change (UNFCCC). This noted how the UK's 2017 Clean Growth Strategy outlines how it will meet its Paris Agreement obligations. Notable policy decisions to this end in the UK now include a committment to end the sale of new petrol and diesel cars and vans by 2040; phasing out the use of unabated coal (ie coal power generation that does not include carbon capture and storage) by 2025; and supporting British businesses to improve their energy productivity by at leats 20 per cent by 2030. A global temperature rise of a few degrees may not sound like much. However, even this degree of warming will have major implications. For example, a two degree rise in average temperatures is anticipated to lead to a 20 per cent fall in crop yields across Southern Europe. Estimates suggest that between fifteen to forty per cent of all species also face extinction in the face of a two degrees centigrade increase in average global temperatures. Due to increased glacial melting, climate change will also cause sea levels to rise. Over the past century global sea levels have already risen by 17 cm, and the IPCC expect the oceans to rise by a minimum of 18 cm and a maximum of 59 cm by 2100. In turn this means that between 75 and 200 million people face flooding risks due to climate change. If temperatures rise by three or four degrees, then sea level rises will threaten to inundate many major metropoli including London, New York, Tokyo and Hong Kong. More broadly, most people will be impacted by climate change to a greater or lesser extent as we experience more extreme weather and related disruption. In particular, climate change is likely to lead to rising food prices as more crops are destroyed by increasingly "freak" weather. Most greenhouse gas emissions result from burning fossil fuels, making cement, clearing land, and agricultural production. Most people understand that burning coil, oil, natural gas or wood releases carbon dioxide into the atmosphere, and if we want to reduce greenhouse gas emissions that we need to consume less of these fuels. However, what is less well advertised is the impact of deforestation on greenhouse gas emissions. When trees are felled, and when land is burnt to be cleared for agricultural purposes, the carbon dioxide held by the vegetation and peatland is released into the atmosphere. Indeed, according to the Global Canopy Programme, deforestation is currently responsible for around twenty-five per cent of all carbon dioxide emissions. One way to control climate change would therefore be to put in place incentives for people to cut down fewer trees and destroy less rain forest every year. The most obvious way to prevent too great a level of future climate change is to burn fewer fossil fuels, or at least to capture and store the carbon dioxide released when such fuels are burnt. This could involve the exploitation of alternative energy sources (including lunar helium-3, not to mention solar energy and wind and wave power). However, rather than focusing on finding new ways to power our machines, another alternative would be for most people in developed nations to adopt more local living and to consume less energy in the first place. As already noted, greenhouse gas levels could also be lessened by reducing deforrestation. They would also be reduced if we built with less cement and raised and ate less meat (as all livestock emit the greenhouse gas methane from their digestive systems). As it begins to bite, climate change may also be tackled via future large-scale, macroengineering projects. For example, nanotechnology may one day permit the construction of a suite of atmosphere filtration plants around the globe could enable greenhouse gasses to be removed from the atmosphere and their levels stablized. Indeed, to cite nanotech guru Eric Drexler, "molecular manufacturing capabilities based on advanced nanotechnology will make it possible to reduce CO2 concentrations to pre-industrial levels within a short time span". As another alternative, synthetic biology may allow the creation of new forms of ocean algae that will absorb great quantities of carbon dioxide and so lower atmospheric concentrations. Yet another possibility may be to stop so much solar radiation hitting the Earth, so permitting us to tolerate higher greenhouse gas levels with no ill effects. To accomplish this, giant, controllable solar sails could potentially be constructed in orbit to partially shade the Earth and stop us receiving quite so much sunshine. A white paper presented by Kenneth I. Roy in 2001 suggested that 100,000 square kilometres of solar sails may be sufficient to allow us to take control of climate change. Unfortunately, building such sails on the ground and then launching them into space is unlikely to be possible. Solar sails would therefore probably have to be constructed in space, maybe using raw materials mined from the Moon or asteroids. Alternatively, materials may be lifted into orbit using a future space elevator that would climb into orbit up a very long, carbon nanofibre cable. 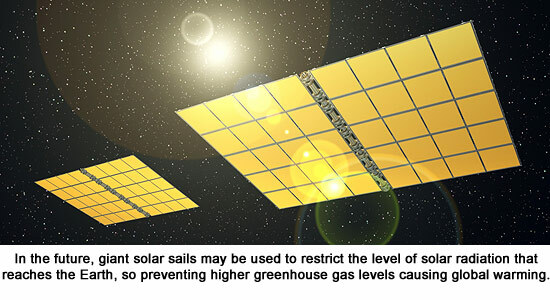 The construction of solar sails to control global warming may at first sound like an impossible endeavour. But so too did sending a human being to the Moon in the 1960s, and that mission had no planet saving ambition. As the decades turn, space-based solar sails could also turn out to be a more viable solution to global warming than persuading billions of people to radically change their lifestyles. If you like, why not watch my Global Warming Solar Sails video? Climate change remains a controversial topic. Some people still do not believe in it, many believe it is a natural process and not the result of human action, and yet others think that any actions to prevent climate change are either futile are too costly in comparison to the implications. This said, as noted at the start of this page, the link between climate change and the emission of greenhouse gasses resulting from human activity is now accepted by a very broad majority of governments and the Paris Agreement has come into force. As a result, what particular individuals or businesses think about climate change and the science behind it is becoming secondary to the fact that we are all going to be impacted by climate change mitigation measures that will increasingly be put in place and legally enforced in most nations. As a result of the above, every business now needs a Paris Strategy, as every sensible business ought to be making plans to deal with an environment that is changing not just physically, but also in terms of market regulation and consumer expectation. To publish an Annual Report that does not include at least one paragraph indicating the company's planned response to the implmentation of the Paris Agreement would now, to me at least, appear to be both a very poor and a very strange decision in terms of both consumer and investor relations. This page last updated 12 October 2018. 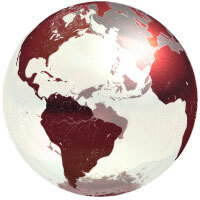 Please visit our sister site at ExplainingComputers.com.